It is no difficult to approach Arari Port. Yet, there is a small island, Benten-jima, at the port entrance. You move through the narrow entrance between Benten-jima and the lighthouse. The small island will not come into sight until just in front of it even in a calm sea condition as well as in a rough condition. As it doesn’t come into sight early, you might get nervous when you visit first time only with a chart and a pilot book. So, aiming to the lighthouse, you will finally find the small island. I put “Arari Entrance” waypoint at 34 49.730N　138 45.960E, which is between Benten-jima and the lighthouse. 1) Passing by the lighthouse on your right, a group of yachts mooring to buoys comes into sight on your right. Move around those yachts, move further into a small cove where Arari Ship Builders is. Moor your boat at a pontoon there. 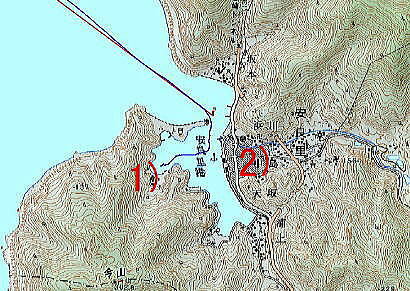 If you want to go to Arari town on the opposite shore, you will need a car or a dinghy with motor. Both can be rented. The pontoon is equipped with water and electric power. Hot shower and toilet with bidet functions are 24hr available. I also used a laundry machine. One night stay for JPY2,100. The natural environment around the facility is great. With my first visit, I now recommend you to stay here. 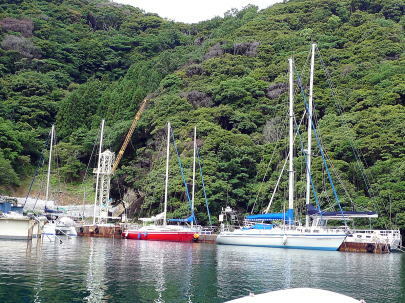 2) When you ask Gyokyo for berthing, moor your boat at the quay in front of Gyokyo building, which is to your left when you enter into the port. One night stay for JPY2,100. Daytime use for 1,050. No limit to the boat length. Water for JPY200 with no usage limit. Toilet is next to Gyokyo. Gyokyo opens 8:00-17:00 on weekdays, closes on Saturday afternoons and Sundays. When Gyokyo is closed, you may moor at the opposite shore in front of a shed for ropes, which has water and toilet. The new quay on the opposite shore is open for mooring though, you need a dinghy to go to the town. In Arari town, there is a mid-size Nokyo supermarket for provisioning. Another shop for fresh produces is in front of Nokyo shop. There are some restaurants. There is no public bathhouse in Arari town. Do you choose the Gyokyo berth without bathhouse, or choose Ship Builders berth with hot shower ? Arari is located at the west coast of Izu Peninsula. The west coast is called as “Nishi (=west) Izu” in Japanese. When you sail Nishi Izu waters, you can see Mt. Fuji to your north.